1.) Theatre (or theater). * In General American English and related accents, ‘theatre’ can be pronounced so that it rhymes perfectly with ‘feeder’ (θiɾɚ). This contrasts with the pronunciation in British RP (and other non-rhotic Englishes, such as New England) where the first syllable is more of a diphthong lax vowel, almost rhyming with ‘fear the’ (θɪətə). Both pronunciations make sense given the patterns of their respective dialects. But there is a third pronunciation heard in both Ireland and The American South, in which the word is pronounced as if it were the two separate words ‘the ater‘ (θi eɪtə(r)). That is, the ‘e’ and ‘a’ in the first half of the word are treated as two separate syllables. Is this a spelling pronunciation? Does it predate the other two more common variants? And besides the two places I mentioned earlier, where else is this pronunciation common? 2.) Cinema. 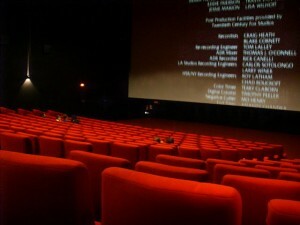 Most British dictionaries list a pronunciation of ‘cinema’ identical to the American version: sɪnəmə (i.e. ‘sin-uh-muh’). But another very common British variant is to pronounce the final syllable of this word with the ‘broad-a’ in ‘father:’ sɪnəmɑ: (i.e. ‘sin-uh-mah’). John Wells wrote a post about this topic some years back, but had few answers. Is ‘cinema’ perhaps an attempt to match the French pronunciation of the word? (An interesting exception to the general rule that the British try to Anglicize French words where Americans make a vague attempt to preserve the original pronunciation). Or is there something else at play here? *Just to clear up a common misconception: It’s perfectly acceptable in America to use the ostensibly ‘British’ spelling of ‘theatre’ with a final ‘-re.’ I believe there is a vague rule to the effect that we reserve the ‘-re’ for descriptions of ‘theatre’ as an art form, but use ‘theater’ to describe individual auditoriums. This entry was posted in English Phonetics and tagged General American English (GenAm). Bookmark the permalink. 1. Theatre. The mid 17th century English orthoepist Hodges gives a pronunciation of “theatre” that is trisyllabic with first syllable stress (reported in Dobson, “English Pronunciation 1500-1700”). For what it’s worth, neither Wells LPD nor Wiktionary supports a disyllabic pronunciation for AmE. Interesting. I wonder, then, if the FLEECE-FACE-lettER pronunciation is older? Maybe it is. The French etymon théâtre has (for those still making the distinction) a long vowel in the second syllable, which would normally end up as a FACE syllable in English. That’s interesting; I think of myself as speaking more or less “General American” (definitely rhotic) and I’ve never heard anyone say theater to rhyme with feeder. I say thee-uh-ter, like the way you describe British/New England except I do pronounce the r. I don’t, however, do the Southern thee-ey-ter… my “thee-uh” is more of a diphthong. Intriguing: I wonder if the fact that I’ve been involved in theatre for so long prejudices me toward the pronunciation of ‘theatre’ in which it rhymes with ‘feeder.’ I asked my wife (also a theatre person) how she pronounces the word, and again, it tends to be perfect rhyme with ‘feeder.’ Perhaps it’s because among people immersed in that world, the word is so frequently adjectival or part of a compound: ‘theatre lighting,’ ‘theatre reviewer,’ ‘theatre actor,’ ‘musical theatre,’ ‘experimental theatre,’ etc. Hence, the trisyllabic pronunciation is perhaps a bit more ‘cumbersome’ than for someone who only uses the word in contexts such as ‘what time do you want to meet at the theatre?’ Total speculation, of course, but a fascinating bit of myopia I’ve never examined! Interesting. I pretty much speak “General American” and no one where I grew up said it the way you describe. Everyone I grew up with said “theater” θiɾɚ to rhyme with “liter”*. But strangely (as DW alluded to), I’ve never seen this pronunciation listed in any dictionaries, pronunciation or otherwise. I’m a 22 year old from the Midwest FWIW. LPD also lists another pronunciation you don’t mention. This is a trisyllabic pronunciation with the vowel of neck in the second syllable , i.e., θi ˈɛt ə**. * I picked an example with a “t” instead of a “d” because I’m not so sure that every American has that neutralization. I agree, vehemently. I have degrees in linguistics and speech pathology and am VERY aware of such usages. I”ve never heard this one-syllable rendering. Thee-uh-ter is all I’ve ever heard in CA-IA-MA since 1950 or so (where I’ve spent the most time) and on TV. Where do you come from? I grew up in Northern California and Maryland (DC area); I now live in Boston. Granted, the “uh” in thee-uh-ter that I’m thinking of is quick and not at all emphasized (unlike the Southern variety mentioned) and if I’m talking fast it *almost* disappears. But I definitely make a conscious effort to pronounce it. For me, it is similar to the beginning of “Beatrice”. To be fair, I think ‘Beatrice’ can be pronounced as with a monophthong, even if the underlying representation is diphthongal. Come to think of it, I think what’s being described here is not really different than the the evolution of the British NEAR vowel from a centring diphthong to a monophthong within the past century. What would the underlying representation be in an American accent? It can’t be /ɪə/ because that isn’t a phoneme in American English. How often do you hang out with people in their 20’s? This could be an age difference. Well obviously there’s an age difference. What I meant is that this the disyllabic pronunciation may be becoming more common, so it’s more common with younger people than with older people. You could make the case that it is the same vowel (or rather, vowels) as ‘idea.’ That is, that it is essentially two syllables: [i.ə]. I realize that’s not very satisfactory as far as ‘theatre’ is concerned, because it implies that both [i] and [ə] are equally weighted. You hit the nail on the head there: because /ɪə/ isn’t a phoneme in GenAm, words like this are a tricky to analyze. Strangely, in my dialect of General American, theatre doesn’t seem to behave like ideas, despite having the same phonemes in the underlying representation. The two-syllable pronunciation ‘/θitɚ/ sounds fine to me, but /θɪtɚ/ is clearly wrong. On the other hand, /aɪdɪz/ sounds fine, but /aɪdiz/ are those cards you have to keep in your wallet. I don’t see how treating theater as three syllables thie-uh-ter implies the first two vowels are equally weighted. The first is a stressed syllable, the 2nd isn’t. Thus the first is stronger. I personally have /θi.ətɚ/ for “theater”, and all the online dictionaries have looked at have that as the GenAm pronounciation. With normal English compression rules however, it would not be suprising that people would use a variant like /θitɚ/ or have that variant as their primary pronunciation. However, this in itself doesn’t get to the heart of the difference between rhotic and non-rhotic accents in regards to ‘theatre.’ For non-rhotic accents, the ‘ea’ is part of a much broader set of vowels including NEAR words; for rhotic accents, the vowel is much more difficult to phonemicize, because there isn’t as large a set of IDEA-type words. I applaud the clarification of the usage, “theatre” for the art form, the general institution of playwrighting, acting, stage production etc. And “theater” for each physical auditorium. That just rings absolutely correct, in my book. I just don’t see rhyming with “feeder,” though, I always hear a little, slurred-over “ut” in the middle. I’ve always pronounced it “thee-uh-ter,” with a half-rhotic “r.” I’ve never heard anyone rhyme it with feeder. I HAVE heard the tri-syllabic pronunciation from people native to southern Ohio, Texas, etc. I’ve never heard anyone say “sin-uh-MAH,” unless affecting a trans-Atlantic accent. Of course, simply because I haven’t heard them, doesn’t make these pronunciations non-existent. I’ve never heard anyone say “sin-uh-MAH,” unless affecting a trans-Atlantic accent. Neither have I. The pronunciation often heard in England is “SIN-im-aah”, with first syllable stress (and maybe secondary stress on the final syllable if you’re into that kind of thing). The word that sounds most Frenchified to me in British English is the pronunciation of Restaurant as if one was speaking French. Res-TRAN (sorry IPA not available easily on my iPad). It’s rare, but I used to hear it at the cinema in the 80’s in London. I think your example of cineMA is another rare, obscure pronunciation that also apes French. I too work in theatre (but in Canada). While the schwa is significantly reduced, it is certainly still there phonemically. If I took my pronunciation of theatre and replaced the “th” with an “f” in an audio editor, it would NOT be the same. My theory about swapping the TH for the F in the two words didn’t bear much fruit, so I left it out—it just sounded like *featre* and *theeder*! Of course, this is just ME. Your mileage and pronunciation may vary (significantly). Wow, that’s one of the coolest things I’ve seen someone post here! Interesting that it can sound perceptually so similar but is still there, even if its duration is fleeting. 1.) Generation A: ‘theatre/feeder’ is strongly unmerged in both production and perception. 2.) Generation B: ‘theatre/feeder’ remains unmerged in perception, but the two are somewhat closer in production. 3.) Generation C: ‘theatre/feeder’ are merged in both production and perception. No idea if this matches reality even remotely, but I’m intrigued by the hint of a generational divide these comments suggest. @Eric: Thanks for posting that! I more or less pronounce theater and feeder the same as you do. Doesn’t that three-stage evolution describe pretty much all mergers? Add me to the short list of people who actually have heard the pronunciation /θiɾɚ/. But my impression is that /θi.ətɚ/ is the most common, and that’s what I use. And /θieɪtə(r)/ is also quite common in Utah. I think “cinemar” derives from the south of England where many letter ‘A’s have a mysterious ‘R’ added to them. Master and Plaster become Marster and Plarster. It happens in names too, so while footballer Didier Drogba is called just that here in the north, in the south he’s often Didier Drogbar – most notably by a well-known and respected national commentator. As London is in the south and within the countries of this pronunciation, I suspect Cinemar has travelled a little thanks to its use by people in the media. As a modest northerner, I can’t work out any rules as to which words have an R added to them. Sorry, my phone meant to say “boundaries”, not “countries”. Those words don’t really have an R added to them. You just think they do because you have a non-rhotic accent. Then that closes the whole discussion, Eric, as it’s why it sounds like some people are saying Cinemar. I’ve obviously been reading this page too much! I meant Bobby, not Eric. Maybe I should stop now. Does the Southern English pronunciation of “cinema” have a final syllable that rhymes with “spa”, or “spar”, or both? If both, then you are a non-rhotic speaker, and the “r” in the spelling doesn’t actually represent an /r/ sound, but rather a lengthening/backing of the “aah” sound. That is what Bobby Craig is trying to point out. See http://en.wikipedia.org/wiki/Rhotic_and_non-rhotic_accents for more details. Google “Rhotic_and_non-rhotic_accents” for more details. I guess this is one more way that the South is behind everyone else- I’m 25 and I would say that my peers here in Atlanta are all Generation B-ers the way you describe it. There’s definitely 3 syllables, but the second is usually a barely-there schwa. Everyone else in Georgia seems to pretty uniformly use the thee-ate-er pronunciation. Also, first time commenting but I’ve been reading your blog for a while now and really enjoy it, so thanks! My mother and both her parents use the three syllable option of theatre, I would say my grandparents spoke cockney (they are WWII East Londoners) and my mother speaks a watered down version, probably more “Estuary”, I asked her why she says it this way but she said she didn’t know. It’s one of the few divisions between mine and her speech, (and indeed my sister’s) so I think it’s probably dying out in our neck of the woods, but it certainly did exist in East London / Essex at one point. Born and raised in northern CA, living in NJ, late 30s. I say /θiətɚ/ and /fi:dɚ/. I’m not aware of anyone saying /θiɾɚ/, but it’s not a word I encounter often. As for “theatre”, I say /θiətɚ/ and /fi:dɚ/, as IVV, but I think I’ve heard /θiɾɚ/ somewhere. Grew up in southern NJ, living in PA.
where it sounds very close to “cinemar” and “camerer”. I don’t think it’s so much an elongation of the vowel as an intended “r” sound at the end, which stops just short. A similar situation, I think, to the way that the common hesitant, fumbling syllable is presented in written form. For Americans, it’s “uh”, while for the English, it’s written “er”. They sound almost identical to each other, but with the English (depending on the dialect), you can just about tell that they’re *thinking* the “r” even though they’re not pronouncing it. At any rate, the “r” is a pointer to how the “e” is pronounced (in my humble American opinion). Tom, what does “as IVV” mean? Nevermind, just figured out that’s another poster’s name. Late Sunday night while driving and searching for something on the radio I heard a broadcast by Leo Laporte, a technology/computer guy who, according to Wikipedia, was born in Manhattan. I noticed that he said “the – ater” very distinctly and very much like I used to hear where I grew up in Georgia. He didn’t seem to be pronouncing it ironically. Long-time reader, first-time commenter. Interesting discussion! I’m the youngest one here (I think! ), and I always use the longer pronunciation (/θiətɚ/). Background: I’m 19 years old, from Austin, TX. I wonder whether the people who say they are hearing the two-syllable pronunciation of “theater” are really hearing the three-syllable version, but with a middle syllable so short that it’s getting overlooked. In my speech (early 40’s male, grew up in Tucson AZ), I have three syllables, but the middle one is so short that it’s barely audible. It’s like [θi.ɪ.ɾɚ] where the ɪ is extremely short. Perhaps the most audible difference between [θi.ɪ.ɾɚ] and [fi.ɾɚ] “feeder” is that in the former the stressed vowel sounds a bit longer. As a southern Englander, I say “SIN-um-aah”, as has been mentioned somewhere above, but if I had retained the accent of my native Gloucester, it would have been “SIN-um-aaR”, with a very rhotic “r”. I had that accent beaten out of me by my northern parents (there were always trooble at’ mill…)….no that’s not true, I had it elocuted out of me, and I listened to BBC Home Service/Radio 4 a lot, and I’m fairly RP-ish now. But my late father-in-law (born during WW1, Preston, Lancashire) had an interesting pronunciation: “KEEN-em-aah” (with the “i” as more [i] than [I] ), which he said was from the related Greek word. I’m not sure if this was common when he was young, but I’ve never heard anyone else use it. He had a very large vocabulary and loved using obscure and dialect words, and he’d had an old fashioned grammar school education learning Latin and Greek. (& taught himself Italian and Welsh as an adult). (in every day life, we grew up calling it “the pictures” (“pict-chas” or “pict-yeRs” in Gloucester) and this is what my wife & I still use, but I’m not sure what young people say now). I am that rarest of breeds. An American English speaker (non-southern), and I pronounce “theatre” with three syllables. I stress the first two syllables almost equally, if maybe giving slightly more emphasis to the second syllable. Everyone I ever talk to (around where I live, pacific northwest) that hears me say it will invariably ask me to say it again, and then proceed to make fun of me. I think I picked up the pronunciation from my mother (also not southern, strange) but had it entrenched when taking french class for years, and got used to their pronunciation of “théâtre”, which stresses the second syllable. Some simple research shows that the English word theatre was borrowed from French (not suprising) and originally resembled the French pronunciation more. The French word, in turn, was derived from the the Latin word “theātrum”, also containing the stress on the second syllable. So while the more common pronunciation has become the two syllable variant, it would seem that the three syllable pronunciation is how the word was originally pronounced. 1. thee-EYT-er – [θiˈeɪɾɚ] – With stress on the second syllable and it’s the one I remember hearing in the Midwest and from the lady from Rhode Island. 2. THEE-eyt-er – [ˈθi.eɪɾɚ] – Initial stress. I don’t remember ever hearing this one, but if it did occur, I would expect it to occur in the South. They have a tendency to put the stress in words earlier than other Americans, as many people know. 3. THEE-uht-er – [ˈθi.əɾɚ] – Initial stress, but “uh” (schwa) in the second syllable.